This is a Ulltra Distributors PVT Ltd. brand of the Hindi DVD. Has no UPC Code. Has Ultra Seal. 16X9 Anamorphic Widescreen. 173 minutes Color. NTSC FORMAT. Dolby 5.1 Digital Sound. HAS ENGLIH SUBTITLES. SPECIAL FEATURES: DIGITALLY REMASTEED FROM THE ORIGINAL FILM. Story, Produced & Directed by Rakesh Roshan. Music: Rajesh Roshan. Lyrics: Dev Kohli, Ibrahim Ashq, Sayeed Nasir Faraaz. Starring: Hrithik Roshan, Preity Zinta, Rakha, Prem Chopra & Johnny Lever. Release Date: 8 Aug 2003 (USA). 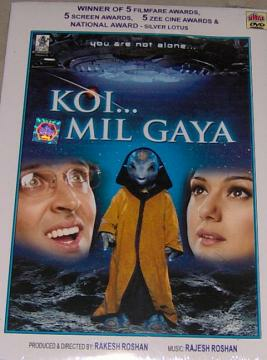 Koi Mil Gaya is the story about Rohit Mehra who shows the world that friendship is truly universal. Sanjay Mehra is a scientist obsessed with establishing contact with extraterrestrial life. He invents many innovative gadgets, instruments and finally succeeds in devising a computer that can transmit messages to space. His foresight becomes reality when as a response to his signals, a spaceship is sighted in the sky. But before Sanjay can even enjoy his success, he and his wife Sonia meet with a horrific accident where Sonia survives but Sanjay loses his life. Sanjay's son Rohit is born into this world; a mentally challenged child who faces ridicule and torment at every face of his life. His lone companion is Nisha whose compassion draws her towards Rohit. One day Rohit discovers his father's old computer and calls Nisha to help him use it. Both of them are completely fascinated by the images and instructions that appear on the screen and relentlessly experiment with the device; not realizing the impact this would have. The whole town witnesses a blackout and a bizarre phenomenon... in an incandescent glowing sky... a colossal spaceship is sighted. However more strange findings are in store for Rohit's town. A pair of footprints not belonging to man or animals are found. What could this mean? Who will Rohit and Nisha find? Is danger lurking somewhere close? A nation holds its breath. Buy Koi...Mil Gaya (DVD, 2007), sold & shipped by Movie Time Video where you can shop online for Pooja Mandir, Bajot, Gifts, Hindi Movie DVD / CD, Music Video. This Hindi Movies collection has been tagged as DS07-1 2 NA 24.95 sam rekha hrithik roshan preity zinta prem chopra (S 1).